The openSUSE Project is proud to announce the release of openSUSE 11.0 — everything you need to get started with Linux on the desktop and on the server. 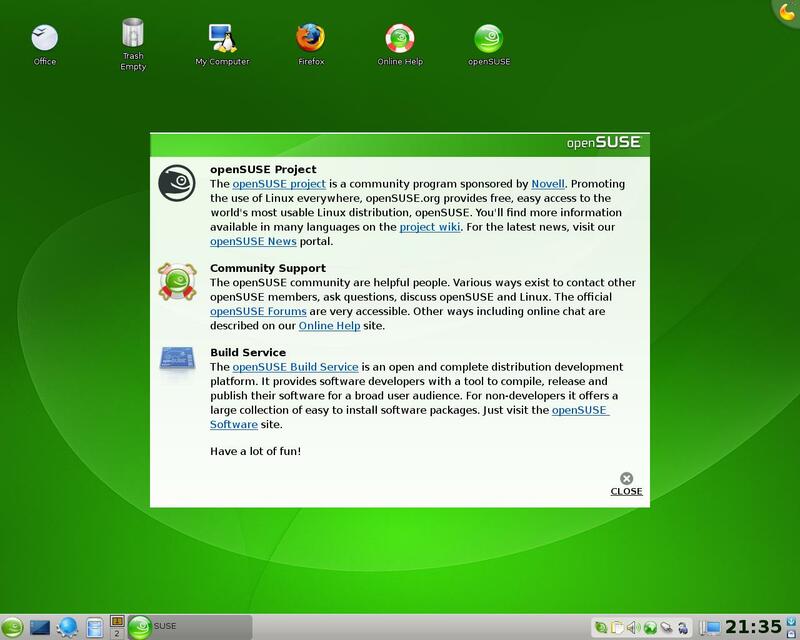 Promoting the use of Linux everywhere, the openSUSE Project provides free, easy access to the world’s most usable Linux distribution, openSUSE. The 11.0 release of openSUSE includes more than 200 new features specific to openSUSE, a redesigned installer that makes openSUSE even easier to install, faster package management thanks to major updates in the ZYpp stack, and KDE 4, GNOME 2.22, Compiz Fusion, and much more. Whether you use GNOME or KDE, the openSUSE 11.0 desktop is a beautiful experience. Users have the choice of GNOME 2.22, KDE 4, KDE 3.5, Xfce, and more! See the screenshot page for a in-depth look at the openSUSE desktop. GNOME users will find a lot to like in openSUSE 11.0. openSUSE’s GNOME is very close to upstream GNOME, because Novell and openSUSE want to do as much work as possible in the upstream release. However, we do modify GNOME’s artwork to provide a unified look and feel for the distro. The default GNOME configuration, such as panel layout, is slightly different than “stock” GNOME, and the openSUSE GNOME team backports a number of bug fixes into our GNOME release to ensure stability and the best possible GNOME experience. GNOME 2.22 in openSUSE 11.0 includes the GNOME Virtual File System (GVFS), with better support for networked file systems, PulseAudio for better sound management, improvements in Evolution and Tomboy, and much more! 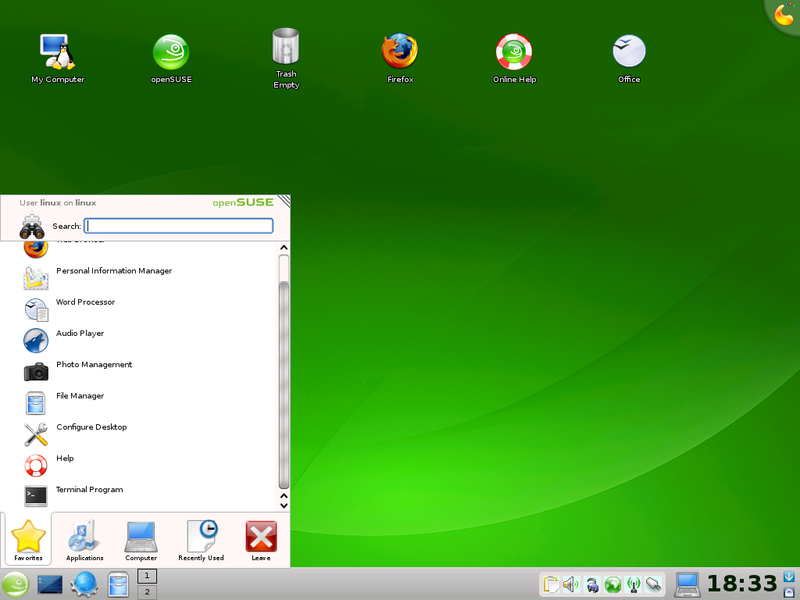 openSUSE 11.0 is the first openSUSE release to include a stable release of KDE 4.0. This release includes sweeping changes in the KDE desktop, and represents the next generation of KDE. This release includes a new desktop shell, called Plasma, a new look and feel (called Oxygen), and many interface and usability improvements. 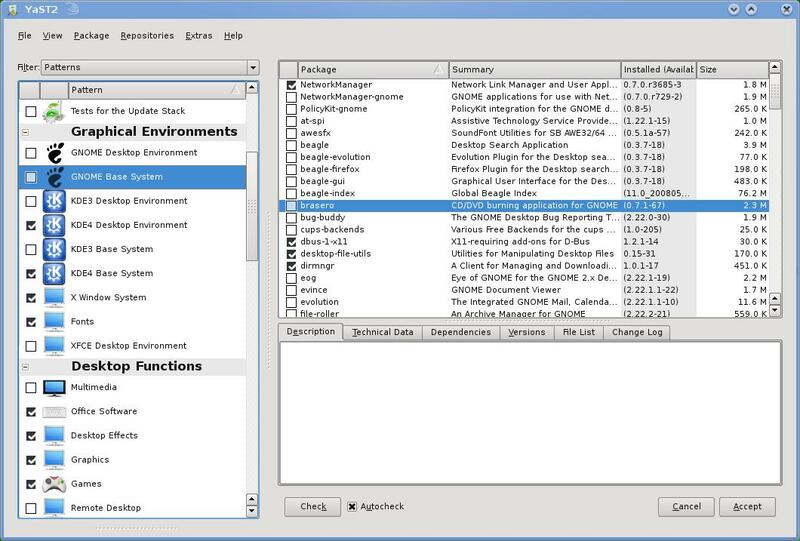 KControl has been replaced with Systemsettings, which makes system configuration much easier. KDE’s window manager, KWin, now supports 3-D desktop effects. KDE 4.0 doesn’t include KDEPIM applications, so the openSUSE team has included beta versions of the KDEPIM suite (KMail, KOrganizer, Akregator, etc.) from the KDE 4.1 branch that’s in development and scheduled to be released in July and for online update. Note that KDE 3.5 is still available on the openSUSE DVD for KDE users who aren’t quite ready to make the leap to KDE 4. The openSUSE desktop is not only a green glorious sight to behold, it’s also available in 3-D! Compiz Fusion is now the default in openSUSE 11.0. You’ll find a slew of interesting Compiz plugins, as well as easier configuration with Simple CompizConfig Settings Manager (CCSM) and the more comprehensive CompizConfig Settings Manager that allows detailed configuration of your Compiz setup. 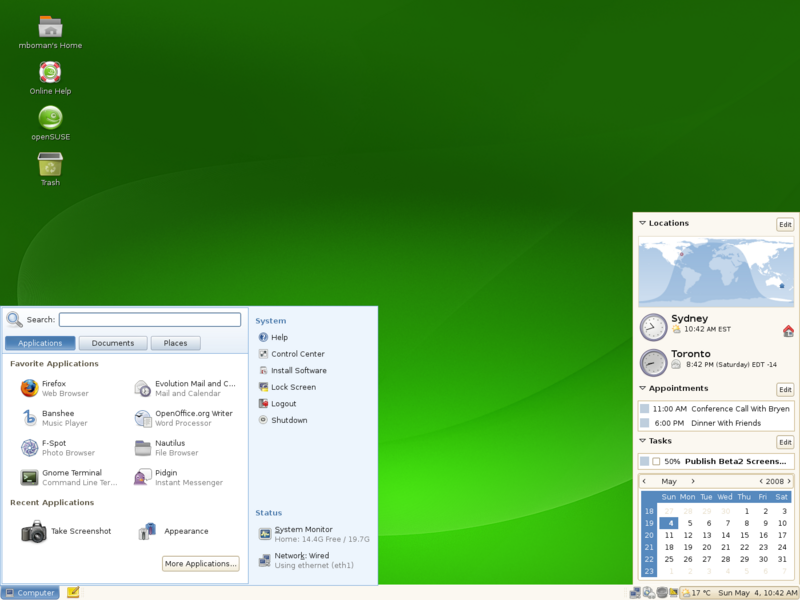 See the Sneak Peek for a detailed look at Compiz Fusion on openSUSE 11.0. Firefox is one of the most popular open source applications on the planet, and the openSUSE desktop just wouldn’t be complete without Mozilla Firefox. The 3.0 release has a number of new features and improvements that will make browsing the Web on openSUSE convenient and safe, including better site identification features, simplified add-on installation and management, detection of “phishing” sites, the ability to save tabs on exit, better download manager, and a new page zoom feature that lets you zoom text or the entire page. Note that openSUSE 11.0 ships with Firefox 3.0 beta 5, and updates to the final 3.0 release will be available through online update. 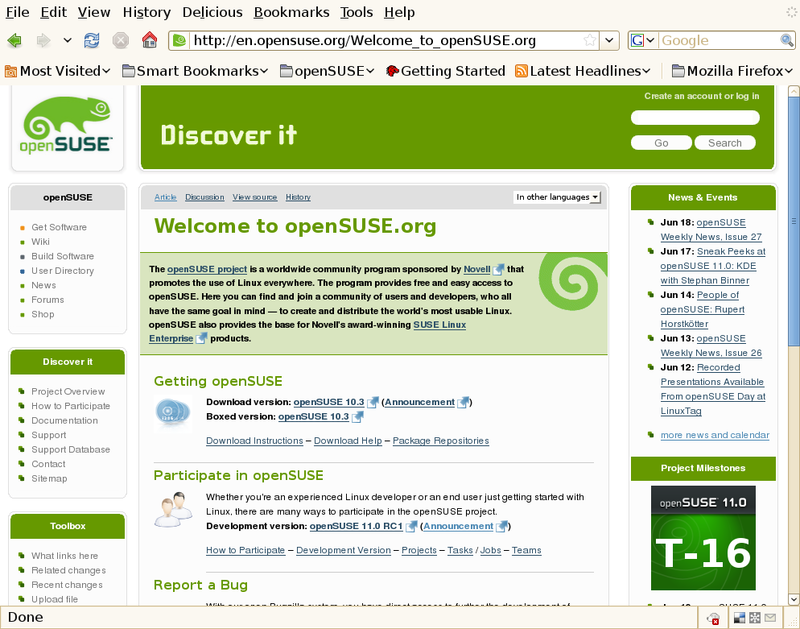 openSUSE 11.0 includes Banshee 1.0. The Banshee media player has been re-written to improve performance and includes many new features, including video playback, better “shuffle” playback, support for iPods, MTP devices, and mass storage player devices, and support for podcasts and better Last.fm integration. You can work hard and play hard with openSUSE. If you need a high-quality office suite that’s Microsoft Office compatible, look no further than Novell’s OpenOffice.org 2.4. This release includes import support for OpenXML, 3-D transitions in Impress, SVG import support, improved performance over standard OpenOffice.org, and better Excel support and VBA macro support. NetworkManager has been vastly improved since 10.3, and now includes support for multiple network interfaces and UTMS and EV-DO cards. You can download openSUSE 11.0 via HTTP, FTP, BitTorrent, and Metalink from software.openSUSE.org. You can also purchase a retail box with openSUSE 11.0 that includes 90-day installation support, physical media, and a printed Getting Started guide. All of the contributors who have worked on openSUSE deserve a huge thank you. Without your hard work, this release would not have been possible. openSUSE 11.0 is the best openSUSE release yet, and will help promote the use of Linux everywhere! Now, get openSUSE 11.0 and have a lot of fun! The Banshee team has released version 1.0! This release will be found in openSUSE 11.0, and includes tons of new features and improvements over the previous Banshee releases. This is a ground-up rewrite that improves speed, a redesigned interface, better integration with Last.fm, and video management! See the entire release announcement on the Banshee homepage, including screenshots and a full list of new and notable features.If you’d like to help spread the news, please use this Digg link to vote it up. The Banshee team includes openSUSE contributors Aaron Bockover, Gabriel Burt, and James Willcox. The openSUSE Project is proud to announce the openSUSE 11.0 Release Candidate 1 (RC1). The good news is that we’re closing in on the final release of 11.0, but it’s not time to relax just yet. We’re getting really close, so we need all hands on deck to help test this release candidate. Since beta 3 we’ve fixed 578 bugs and resolved 1,118 bugs! Read on to see how you can help get 11.0 into top shape. The first step is to download the release candidate. Please remember that RC1 is not a stable release. As a release candidate, openSUSE 11.0 RC 1 is almost ready for day to day use, but may still have some interesting bugs that make it unsuitable for running a production system. Be sure to have backups of any important data before using openSUSE 11.0 RC 1 on a system. You can download openSUSE 11.0 RC 1 for x86, x86_64, and PPC at http://software.opensuse.org/developer. Deltas from Beta 3 are also provided. Note that you will need the latest deltarpm from Factory, or for openSUSE 10.3 you can use the home:coolo repository to grab it. This is a list of the most annoying bugs, that we’re aware of, that still exist in the release candidate. To help testing, take a look at opensuse.org/Testing, and the Feature Test List page. The Feature Test List page includes a definitive list of new features included in openSUSE 11.0. We need to test these features in particular, so please look through the features on the page, pick one that has not yet had its test completed, and make sure it passes. If not, be sure to file a bug in Bugzilla and mark the test “failed.” See the full instructions on the Feature Test List page. With RC1, openSUSE 11.0 is almost ready for release, but we can still use help with testing before the official release. This is a great chance to contribute to openSUSE, by filing bug reports, testing features, and giving feedback to the openSUSE developers. Report bugs: If you do find a bug, be sure to report it in Bugzilla using the procedure given on bugs.openSUSE.org. Provide feedback: We welcome feedback! Please join us on the opensuse-factory@opensuse.org (subscribe) mailing list. Or in the #opensuse-factory IRC channel. Let the world know! Be sure to spread the word about openSUSE 11.0! Blog about it, tell your Linux User Group, start planning a Launch Party — whatever you can do to let the world know about openSUSE 11.0! Thanks to all the developers and contributors for all the hard work that’s gone into openSUSE 11.0 so far, we’ve come a long way and only have a little more work to do before we have a final release. Fire up openSUSE 11.0 RC 1 and have a lot of fun!